Cannonball Press artists Martin Mazorra and Mike Houston were on hand to meet their fans at the opening. 99% Gallery is on the ground floor a repurposed warehouse at 99 North 10th St, near the East River. The gallery was packed. Beer was courtesy of Brooklyn Brewery, thank you. 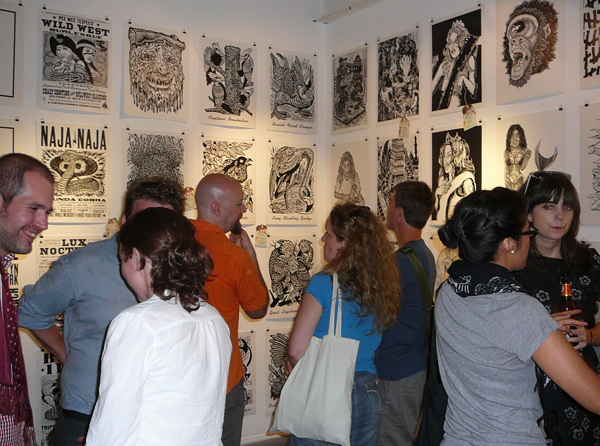 Gallery-goers were snapping up artwork by Mazorra and Houston and other artists printed by Cannonball. Mazorra and Houston are part of the “Outlaw Print” movement. Why outlaw? 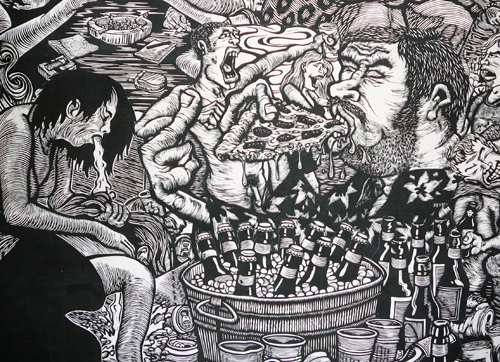 Some “fine artists” and critics despise outlaw printmakers as much as they disdain illustrators. Outlaw Printmaking is about democratic visual communication. It is free to look at. And if you have some cash, the artwork is not too expensive to buy and support. I was able to purchase original prints by Mazorra and Houston and add to my growing collection of works by the Mississippi maniac, Sean Star Wars. Mazorra has a fine series of cuts that resemble Audubon’s Birds of America with avian personality disorders. 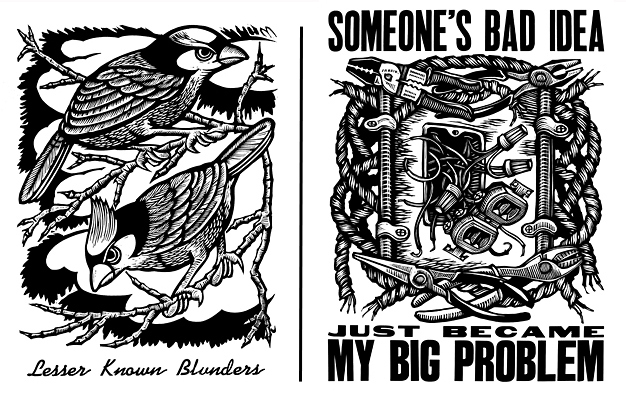 Houston’s new series revolves around creating high-impact woodcut images to illustrate the text of workplace proverbs. His graphic craftsmanship energizes these sayings beyond the commonplace. Martin Mazorra and Mike Houston selling prints. In the true spirit of democracy they have a few things for museums and wealthy people. Cannonball also produces elaborately detailed, eye-popping, mural-sized canvas prints that sell for several thousand dollars. The 99% show runs until Sept 12th. 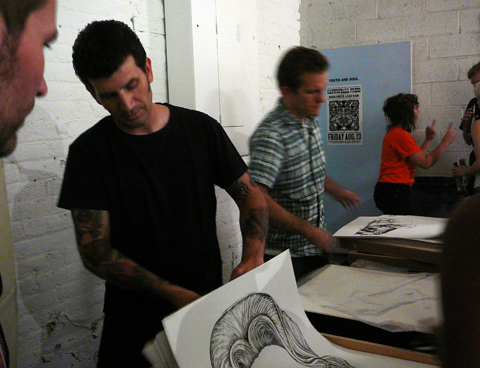 Cannonball’s next big event will be “Prints Gone Wild” at Secret Project Robot, Nov 5 & 6, 2010. Secret Project Robot is also in Brooklyn, but since it is a SECRET, I can’t provide a link, you’ll have to find it yourself! Meanwhile, visit the Cannonball online store. You can buy a work of art for less than the cost of a case of beer. < Previous Joe Lacey of L.A.